One of the biggest events on the local sporting calendar is returning this December when the Women’s Big Bash League (WBBL) hits Howell Oval. For the third straight year, the Sydney Thunder will call Penrith home for a one-off match on December 16 when they face the Melbourne Stars. The Weekender revealed back in August that Penrith Council and Sydney Thunder bosses were in serious talks to bring another WBBL game to the iconic Howell Oval. Yesterday that became a reality when the Thunder and Council confirmed the mid-December match, which includes free admission. 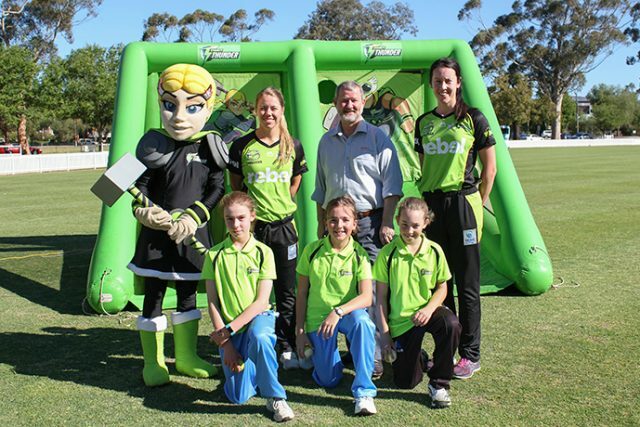 “Council is a strong supporter of women’s sport and in particular cricket, with our collaboration with Sydney Thunder now in its third year,” Penrith Mayor, John Thain said. Sydney Thunder General Manager Lee Gormon said Penrith is an important part of the Thunder region and is pleased to be able to take elite cricket here this summer. “Penrith Council has shown great support for women’s cricket and the Thunder club, and I’m very pleased this will continue,” he said. “The region boasts large numbers of participants in our sport and has developed many outstanding cricketers. This makes Penrith an integral part of our Thunder Nation. The Thunder played the very first WBBL game at Howell Oval in 2015 and faced the Adelaide Strikers there last season. This season will see local batter Naomi Stalenberg return to the club after signing a one-year contract extension while fellow Penrith cricketer Lisa Griffiths has also signed on following her return to cricket last year. “I find Howell Oval a really nice ground to play at,” Stalenberg said. Teammate and close friend Lisa Griffiths said she can’t wait to make her WBBL debut. “I’ve always kept an eye on the Big Bash,” she said. In addition to the WBBL game, Howell Oval will also host a Super Clinic on January 18 featuring players from both the WBBL and BBL squads.